I got the top done. I purchased this top because I love the rustic look. (See the post about the top here for before pictures) I think the irregularities make it charming. I did not want to make any changes to it but I had to do some work to make it flat enough to quilt. I took it apart and did a lot of pressing and a little trimming and put it back together. I had to work around the red fabric. That was a real part of the appeal of the top to me so I had to keep that the size that it was and make the wonky log cabin blocks fit in. And this is the result. I had to cut down 3 blocks on the bottom in order to fit them into the red fabric, and that doesn’t bother me a bit…I think it fits the quilt. it is a good-sized top…8o x 96, and now I will think about how to quilt it…something simple is in order and I hope that I can stick to that! I always seem to get carried away and quilt the heck out of them. Here are some of the blocks which show the irregular piecing that I wanted to preserve. (click to enlarge) There are patterns and pictures all over for what they call “liberated log cabin” but here is a quilt that was 100 years ahead of its time. 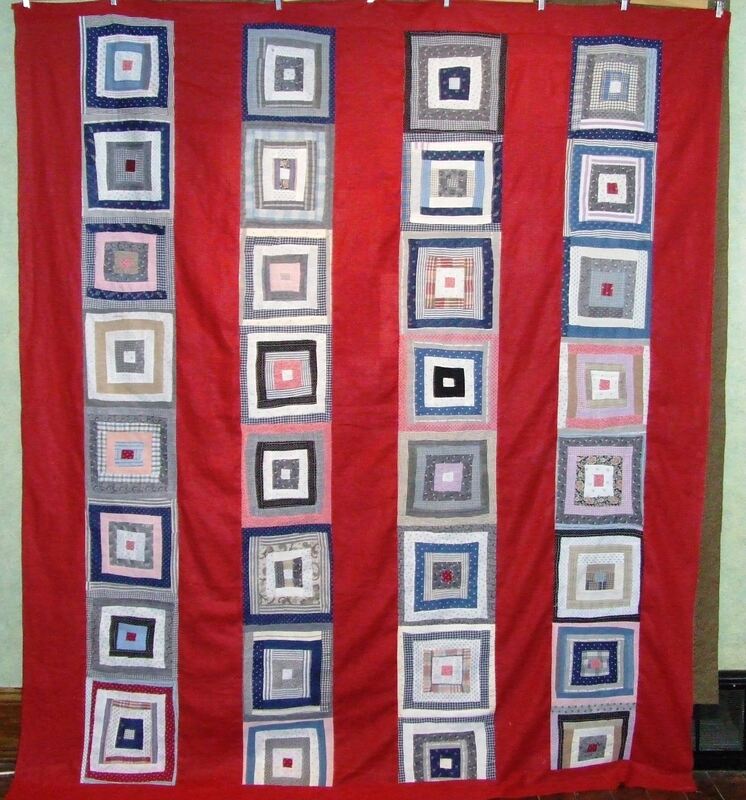 This entry was posted in Quilts and tagged antique quilt top, log cabin quilt, Quilting, Quilts. Nicely done! Hope to see it quilted by Friday! You’re incredible. I can’t believe how quickly you got that done! It looks fabulous – l love the effect with the blocks set with the red fabric. Beautiful! The three cut log-cabins give the impression the rows would continue “behind” the red fabric, like 3-dimensional. I like that! I love it that the fabrics are so period but viewed from a distance it gives an op-art effect. Last quarter 1800s + 1960s = very Steampunk! Done already!!??? The ‘wonky’ looks fantastic! Nice save. Once again-great job! Preserved with the quilters original intent. Maybe a folky hand drawn feather or cable so it’s not too ‘perfect’ and simple concentric squares in the pieced blocks. It’s so much fun to discuss other people’s projects compared to making decisions on my own! Plus with yours we get to see results so much quicker!